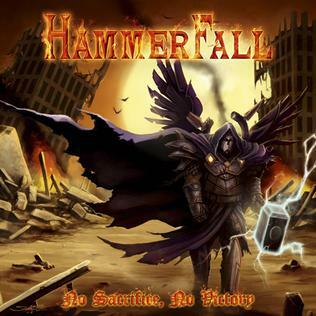 This entry was posted in CD reviews, Heavy Metal and tagged album, any means necessary, badass, beign the hammer down, between two worlds, CD, hallowed be my name, hammerfall, heavy metal, iron maiden, jordan munson, legion, life is now, metal, my sharona, no sacrifice, no victory, nuclear blast, one of a kind, power metal, punish and enslave, Review, something for the ages, sweden, swedish, the knack. Bookmark the permalink. I think it’s an awesome album, but hell, it’s a matter of taste. is dry, boring, and without power and attitude. This is the best vocal performance he’s done in years, and he’s finally got a little bit more balls in his voice. Listen to the chorus in one of a kind, the scream before the last chorus in Hallowed by my name, the middle part in the title track and you’ll see what I mean. I first ran into Hammerfall in 2007 and I’ve never been wholely impressed. Sure their music is more rocking than Catharsis, but there’s nothing original. The vocals are dry and lack passion. I’ve always heard the riffs somewhere else. The keyboard adds nothing, it’s only there to classify the band as power metal. Not that I’m totally impressed, but this is more than I expected for when I stumpled upon a link on Delicious telling that the info here is awesome. Thanks.